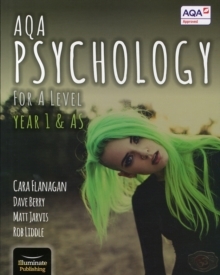 Written by leading psychology authors Cara Flanagan, Dave Berry, Matt Jarvis and Rob Liddle, this Student Book has been approved by AQA offering high quality support you can trust. Designed to be motivating and student-friendly, its engaging visual style and tone will support you through the AS or Year 1 course and help you prepare thoroughly for your exams: Its stunning visual style will help you engage with and absorb the information; Each topic is presented on one spread to help grasp the whole topic, description and evaluation are clearly separated; Plentiful opportunities on each spread to practise your application skills with unique 'Apply it' activities; The mathematics requirements are thoroughly covered with cross-referenced support throughout; Practical research activities will further help you develop your research methods skills; Exam practice and skills guidance is provided for the assessment objectives and mark schemes. For invaluable revision support it combines brilliantly with the Year 1 and AS Revision Guide, Flashbook and Revision App.